The ECUTalk LCD displays are back in stock and can be ordered from the Consult LCD page. After over 8 years, an updated ECUTalk software has been released, download ECUTalk v1.4.0. This release requires .NET Framework 2.0, which is part of all Windows versions since Vista. 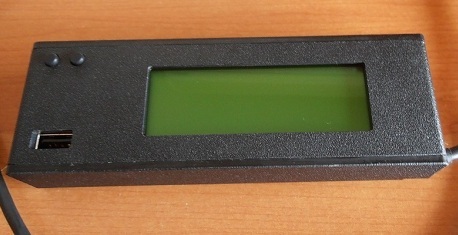 Any new displays purchased will now come with a glossy black enclosure in the new slim form factor, similar to this one shown below (it is from an old batch before the current slim ones were made). New pictures of the new slim glossy enclosure will be on the website soon. This change is due to a change in enclosure manufacturers as the current one is closing down. To purchase, just visit the ECUTalk LCD Display page. Patrick Adams, one of the user's of the LCD display, has written a quick reference guide for navigating around the display. It is written for his diesel engine Elgrand, so some of the features/sensors will be different for other vehicles, but the core of the displays features and how to get to each of them is shown. You can view it here. Many thanks to Patrick for taking time to make this. There has been a firmware update for the ECUTalk LCD Display to add a fuel temp reading to the display for diesels only, in the otherwise blank area due to diesels not supporting fuel economy. Updating the firmware can be done for displays used in petrol vehicles, but it wont show any difference for them unless used in a diesel. Visit the firmware update page to update. To purchase one, go to the Consult LCD page on this website. UK/Europe buyers, you may wish to buy from H-Dev - Â£75.33 shipped to UK, Â£84.99 shipped to Europe (5-15 days). They currently only sell the USB consult cables. #102 - Diesel ECU Support: The display now supports all tested diesels with ECU's - ZD30DDTi, TD42Ti, RD28ETi (and TD27Ti tested with ECUTalk software and should be supported, but no user yet has tried with ECUTalk LCD). If the Diesel doesn't have an ECU (e.g. TD42 non Ti version), it will not work. #107 - Remove Unsupported Sensors: This change is with respect to earlier v2.04 beta firmwares for diesel support, which still showed petrol sensors that weren't supported. An updated ECUTalk software beta has been released, download ECUTalk v1.3.5 Beta 7. This release adds support for Active Suspension control unit (sensors and fault codes). 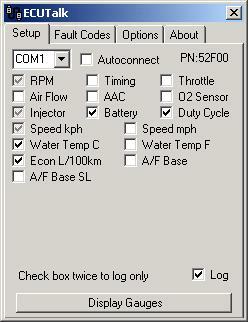 The control unit is selectable via the Options -> Settings -> Control Unit option. 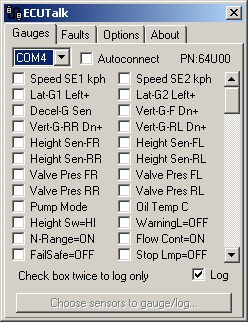 Normal_ECU is for normal ECU dianostics ECUTalk has had previously, ECU_ED is for the few newer vehicles (99 A32 Maxima) that do things slightly differently, and Active Suspension is if your car has active suspension control unit, e.g. Infinity Q45a. 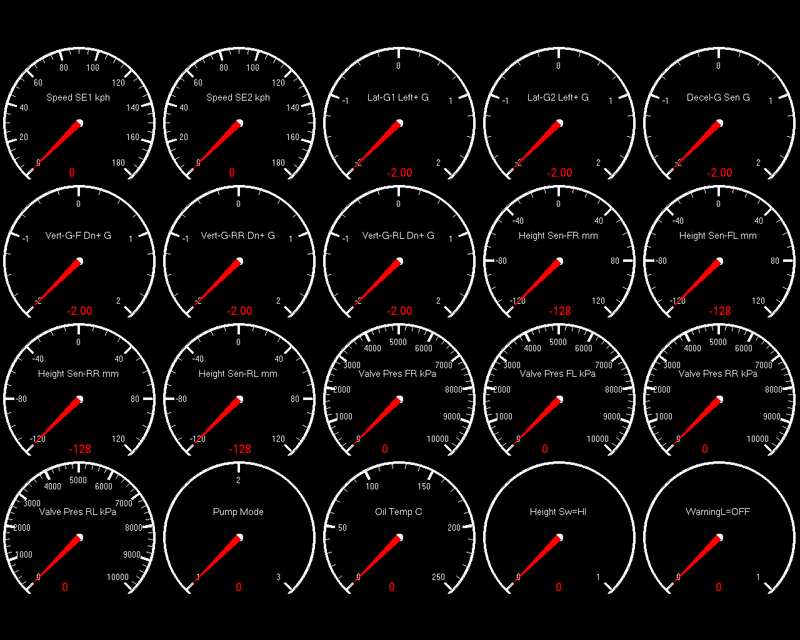 The images below show all possible sensors (not all may be applicable to your car), click to see example gauges. Edit: Beta4 had a bug in it, all the DBR registers would have read as 0. Beta5 didn't have readings for individual switches, get Beta6. An updated ECUTalk software beta has been released, download ECUTalk v1.3.5 Beta 6. This release adds heaps of switch (on/off, open/closed, etc) sensors, and a couple of switch registers that have unknown usage at the moment. If you ever see a sensor with a question mark (e.g. DBR2C?) have a value that changes, let me know. There is a total of 8 switch sensors added common to petrol/diesel, 39 added which are specific to diesel engines, and another 39 added which are specific to petrol engines. Each specific engine will only have a small subset of these (around 10-20 is common), however. An updated to ECUTalk software has been released, download ECUTalk v1.3.5 Beta 3. This update adds proper compatibility for diesels (RD28, ZD30, TD27Ti, and maybe others). 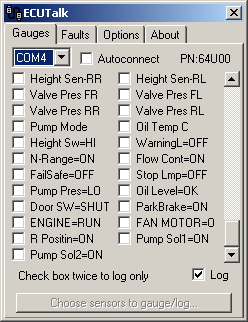 Please contact us if you have a diesel (with an ECU) that isnt listed above, whether the software works for you or not, as you may be able to help us add proper compatibility for any of the sensors specific to your car. Below is two screenshots, the first showing all possible diesel sensors (you will never get all of these on any given engine), and the second shows sample gauges (showing units etc) the more common of the new diesel sensors. An updated ECUTalk software beta has been released, download ECUTalk v1.3.5 Beta 2. This should add basic compatibility for diesels (RD28, ZD30, TD42Ti). Note however some sensors may appear (particularly injector/duty cycle/fuel used/economy) that arent actually those sensors but readings of other sensors. 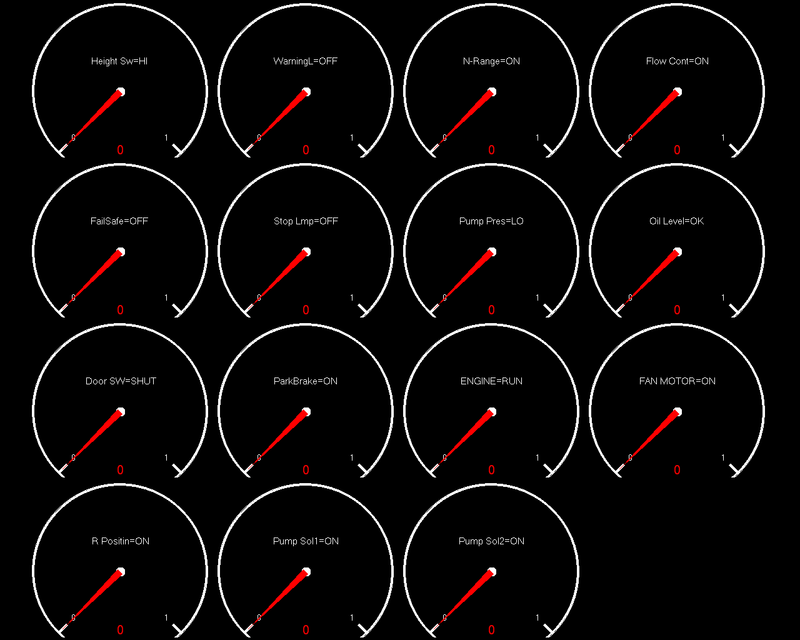 The final v1.3.5 will most likely aim to differentiate between petrol/diesel sensors (i.e. #110). Also, the final v1.3.5 will probably be the last release for .NET Framework 1.1/.NET Compact Framework 1.0. An updated to ECUTalk software has been released, download ECUTalk v1.3.5 Beta. 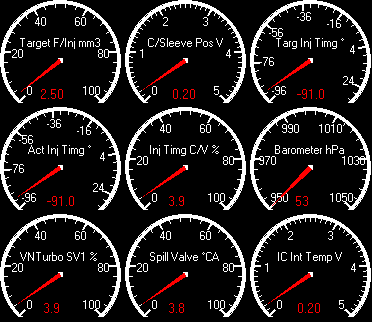 This adds alerts for RPM, Air Flow, Temperature, Speed, Injector Duty Cycle and Voltage. It should also fix compatibility with TB45E engines. The final v1.3.5 will most likely aim to add support for RD28 Diesel Patrol engines, and perhaps other diesels that are compatible. Also, the final v1.3.5 will probably be the last release for .NET Framework 1.1/.NET Compact Framework 1.0. #74 - Save Trip Meter Statistics: There is now a 3rd trip meter screen, only distinguished from the existing one by it saying 'All' at start of second line rather than 'Trip'. That new screen is for all trip data since last clear, rather than only current trip (as the existing trip meter screen is). #98 - Full TB45E Engine Support: This patrol engine reports 'RH'/'Secondary' Injector banks, and therefor trip meter readings etc didn't work as the primary injector bank is always 0 as it doesnt exist. So this is fixed by the display using the second bank readings if first is unavailable. Also added an option to injector options page to disable use of bank1 (this is really only useful for cars with 2 banks, where you dont really care about seeing both banks, and rather simpler view of just single bank reading). #100 - Allow Adjustments on Main Screens: Now the adjustments set in the adjustments page are applied whilst on the main display/trip meter screens. Use at own risk, and please, dont use if you dont know what you're doing!!! If you dont know what these adjustments can do for your car, or have to ask someone (including me - I am not a tuner), then do NOT use them. As with any ECU alterations, you should monitor AFR with a wideband O2 sensor, and monitor knock levels to prevent detonation/pinging (and if you are using the adjustments, you would already know this). #101 - Change Main Sensors: Water temp has moved to the start of the second line, and Ignition timing has moved to the end of the third line. Head on over to the firmware page to download the latest firmware. USB Consult Cables are back in stock. See the consult cable page for more info. Group buys of 5 or more consult cables are welcome, contact us for pricing/logistics. #64 - Alerts: User definable alerts utilising the onboard buzzer on all V2 displays. Alerts are available for water temperature, injectory duty cycle, speed, air flow, RPM and voltage (voltage is the only one which alerts at or below the specified level, the others alert at or above the specified level). 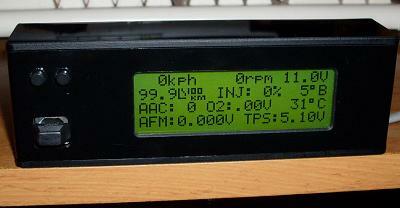 The alerts are only active on the main sensor/trip meter display screens. There are also options to set the pitch level, the buzzer length, and repeat interval. When an alert is triggered, the buzzer will sound and the sensor triggering the alert will flash on the sensor screen (for 10 seconds). The buzzer will continue to sound after each buzzer interval set in the settings. #86 - Bug displaying ATDC timing: Fixed a bug where if the timing is occuring after TDC it will show it as degrees A, rather than showing a negative degrees B value. #88 - Timing retard added to peak values: The lowest (most retarded) timing value will be shown on the max values screen along with existing most advanced timing. #96 - Temporary Fuel/Ignition Adjustments: Temporary adjustments can now be made to fuel percent and ignition timing from the adjust screen. These adjustments are only active whilst on the adjust screen. These utilise the consult 'active tests' to alter the fuelling and/or ignition timing, and are in no way saved into the ECU or alter the ECU fuel/ignition maps in any way (as they are read-only). CAREFUL: YOU CAN DAMAGE YOUR ENGINE IF YOU DO NOT KNOW WHAT YOU ARE DOING WITH THESE. USE AT YOUR OWN RISK. If you dont know what these adjustments can do for your car, or have to ask someone (including me - I am not a tuner), then do NOT use them. As with any ECU alterations, you should monitor AFR with a wideband O2 sensor, and monitor knock levels to prevent detonation/pinging (and if you are using the adjustments, you would already know this). The ECUTalk Consult LCD Displays are back in stock. If you wish to purchase one, head on over to the LCD page and click one of the Buy links (depending on your LCD colour preference and location). Note that the displays no longer come with the glossy polcarbonate enclosure, but come with a matte black enclosure (like what the original ones used to), which dont scratch easily (but is still polycarbonate so still has high temperature resistance). An updated to ECUTalk software has been released, download ECUTalk v1.3.4. This allows you to edit the ini file and use another ECU ID if you have one of the few cars that doesnt use the default id EF. E.g. some cars it is ED instead of EF. Also fixed a bug which didnt allow ports COM10-COM19 to be used. There is stock again of the V2 displays! 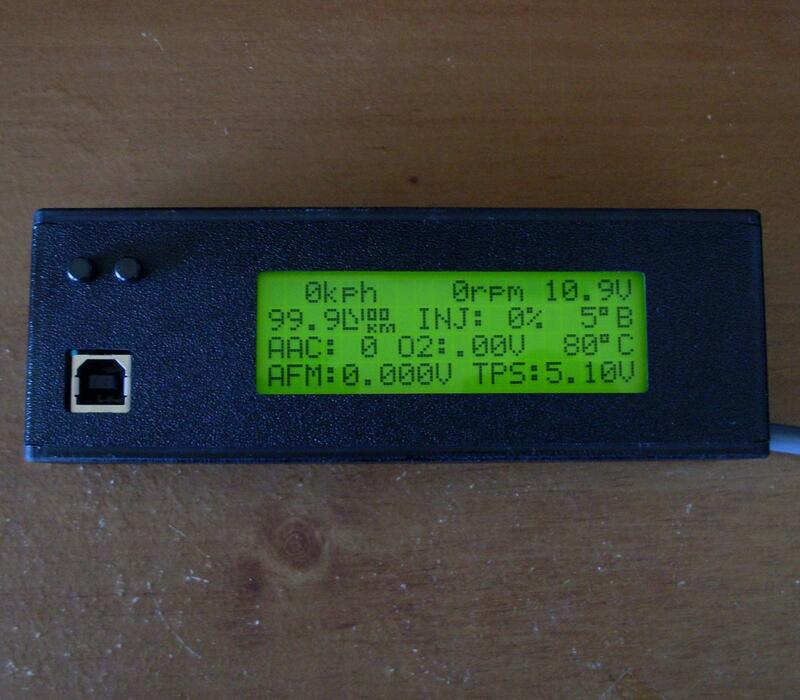 See the V2 LCD page for more information and to place an order. The first update to the V2 display firmware is available on the firmware page. Users who had their displays sent out before September 3, 2008, who wish to log to MicroSD card (in the future when firmware that supports logging is released), will require a modification (adding a resistor) to the display to lower the voltage going to the MicroSD card slot. 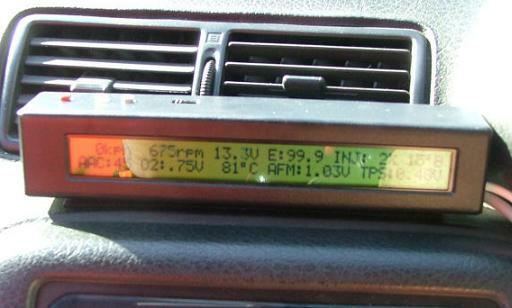 Users who had their displays sent after September 3, 2008, will already have this modification done. Note: Existing data on a MicroSD card will be lost if used in the display - the card is written to in a lower level format than a PC will be able to read. Retrieving logs off the card in future will be done via USB, you wont remove the card from the slot, so just buy one for use in the display. Your car is a Nissan that is still running the stock ecu. Piggybacks/remaps are generally fine, but aftermarket ECUs wont work (PowerFC, Motec, etc). You can locate the consult port near the incabin fuse box. 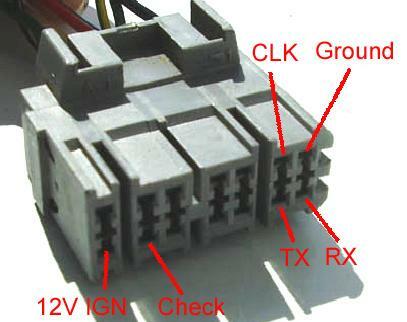 Most likely your car DOESNT have the OBD2 port (16 pin trapezoid). Some cars, esp US/Euro, lost consult when they gained OBD2 after 1996. On the other hand, most AUS/JAP cars didnt rush in OBD2. Off the top of my head, all these cars should support consult: S13 (not CA18 engines), S14, S15, N14/B13/GTiR, N15/B14, Z32, R32(9/89+), R33, R34, C34, A32 (not A31), NX/NXR (SR20), U12/U13/U14/U15 (SR/KA), W10/W11, Q45, G20, K11, P10, some P11. Note that if the display doesn't work with your car, you can send it back if its in original condition for a refund (minus postage). If you would like to purchase a display, send an email, and a few more details and payment info will be sent. Price is $220 + postage ($7 in Australia, $15 outside), add $5 for blue screen. The ECUTalk Consult LCD V2 Displays are finally finished. There is a first batch of around 90 (100 minus ones 'consumed' by the different enclosure manufacturers and other testing) which are pretty much all reserved for people on the interest list for getting a display. These people will be contacted over the next few days to organise payment and shipping. Once this first batch are sold, a second batch (of probably 100) may be started if sufficient demand. 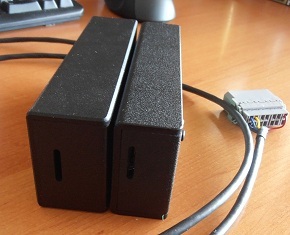 Just received a prototype enclosure from the place that will be making enclosures for the first batch of V2 displays. Will probably have them ready around the start of August. Here's a picture of it. Looks better in person but you get the idea. Dimensions are 144mm wide, 48mm high, 33mm deep (buttons protrude 3mm). So it will fit inside a DIN slot. Will try add a shot of the blue screen later on. The last firmware version (v1.0) for V1 lcd displays is available. It adds a basic trip meter screen to the display, accessible by pressing the left/right buttons whilst on the main data display. It pretty much has the same content as the prototype picture for the V2 display is showing. This firmware update is available at no charge. The main chip in the display must be reprogrammed. Simply post your display to me, along with a paid self-addressed return satchel (eg 500g express/standard satchel). Make sure its reasonably packaged. Contact us for address details. V1 firmware version is displayed on the device info screen. Information on V1 firmware versions, and for those interested in how firmware updates will work for the V2 displays, I've updated the Firmware page. V1 displays will be able to be traded in for a $100 discount off the cost of a V2 display. Edit: Whoops! The first upload of the file was broken - this has been fixed as of 2008-05-12 17:10 GMT+10. The final beta build of ECUTalk v1.3.3 has been completed. Still need to update the ECUTalk Software page, but in the meantime you can download it from the above link. Currently we're unable to test it on any car so as usual lettuce know if there is any problems. Planning for probably one more release, v1.3.4, before the move is made to .NET Compact Framework 2.0. Manufactured and assembled PCBs have been received, now we are primarily waiting on the production of the enclosure before the final displays are ready for sale. The status of each of the new features for the display has been updated on the consult lcd display page. Additionally, ordering and draft pricing details have been added to that page. Basically contact us and you'll be added to a interest list and be contacted when displays are available. Over the holidays a prototype was constructed which has been used for feature development. The trip meter screen has just been completed, which is accessed by pressing the right/cursor button whilst on the main display. Depending on whether you've chosen KM or Miles in the options, you'll get one of the two screens below. From left to right, top to bottom, you have: current speed, instant fuel economy, trip average speed, overall trip fuel economy, trip fuel used, average fuel used per hour, distance travelled, and time elapsed. We're a couple weeks away from finishing a prototype design (minus enclosure) for the next LCD display. We're aiming to get the prototypes done before Christmas so work can be on the firmware/features etc over the Christmas break. If all goes well, enclosures etc will be designed and perhaps some local users will get a beta version to help out with final testing. The next version of the consult lcd display is still being worked upon, though progress is a bit slow, and a few key components needed for the display are still unavailable. We've decided upon and ordered a batch of lcd modules that will be used in v2. They are the 20x4 low profile modules from Crystalfontz. One is positive (sunlight assists viewing) yellow/green module. The other is a negative (direct sunlight makes it harder to read) white on blue module. In other news, Beta 4 of ECUTalk v1.3.3 seems to be working well for most users, with only one confirmed bug found. The 4th and most likely final beta build of ECUTalk v1.3.3, beta4 has been completed and put on the website. We're fairly sure all the functionality introduced in these betas now works as intended, though we haven't had much if any feedback from Imperial sensor (Mi/Gal/MPG etc) users. If there are no problems with this build, it will become final v1.3.3. 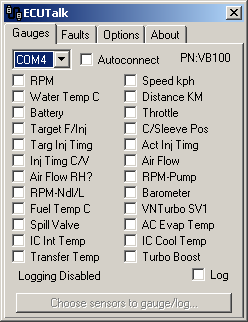 1) For Flush Wait option, 100ms is default, lower values will give quicker startup times, but higher values might help with some connection problems, eg sensors not showing up, ECU part number not being read, gauges not moving when showing gauges, etc. Eg I can use 20ms on my desktop and 50ms on my 568 Jornada. 2) For Font Base Size and Increment, this allows you to specify a font size, and then the amount of pixels which the font size will be incremeneted depending on gauge size. Eg 6pt + 50px increment on a 200px wide gauge = 10pt font. If you find any problems with any features in this beta, if you could send me an email, or sign up to the bug tracker and add a note to the ticket. Future version v1.4 of ECUTalk is likely the time when the software will move over to the .NET Framework 2.0. Therefore, depending on whether any minor releases are done after v1.3.3 before v1.4, this may be the last version of ECUTalk that will work on Pocket PC 2000 and 2002 devices, depending on how hard it is to maintain a .NET 1.0/1.1 version alongside a .NET 2.0 version. Anyone buying a PDA for the purposes of using ECUTalk should try and get one with Windows Mobile 2003 (and up), which supports .NET 2.0. iPAQ's tend to be the best to use, particularly due to the standard connector and being popular. We've put together a (largely uncustomised) feature/bug tracker which can be found here. This will take over from the previous featurerequests list, and will be used eventually for both the ECUTalk Software and the ECUTalk Consult LCD Display. If you have previously contacted us about a bug or potential feature that is not shown as an issue in this bug tracker, either email us again about it, or register for an account (which allows you to submit issues) and create a new issue for it. Next ECUTalk LCD Display will probably have design started be towards the end of the year, possibly being redesigned into a squarer shape (20x4 instead of 40x2 LCD). We're hoping to get a fair few fundamental changes made, potentially setting it up to enable firmware upgrades to be downloaded off the website and upgraded with a laptop - but this will be difficult to accomplish, but we'll see how it goes. Of course current displays are still "upgradable", just requires the main chip being replaced (and not able to be performed by users due to custom hardware needed to write to the chip). ECUTalk v1.3.3 will probably be out towards end of July, and will have a fair few improvements, especially for Pocket PC users. This may be the last release for .NET 1.0/1.1 before the move to .NET 2.0 - this means that Pocket PC 2000 and Pocket PC 2002 users will not be able to use any versions made for .NET 2.0 (only Windows Mobile 2003+), because they do not support the newer .NET 2.0. We've released a (rather major) minor update to ECUTalk, v1.3.2. It's primary purpose was to fix the issues with not dropping packets if CPU can't keep up, but we ended up doing a significant overhaul of the consult reading, gauge performance, and logging aspects. The end result is much more data is able to be processed, especially the capability for amount of data packets that can be logged per second. Increased performance of gauge drawing by ~250% (on our PPC benchmark, time to draw a gauge went from ~30ms down to around ~12ms). Added option to specify minimum gauge update speed - higher value means more packets are logged due to less gauge updates (and hence more time for logging). Eg on a 568 Jornada PocketPC 2002, 10ms = ~5 packets logged/second, whereas 1000ms = close to full 50 packets). The setting ignored when not logging (it will just update as quickly as possible). ECUTalk v1.3.2 can be downloaded from this page. Edit: Use v1.3.2. This version has a bug which means the gauges dont drop packets when falling behind. If you have a slow laptop or most Pocket PCs, then the data will lag. We've released a minor update to ECUTalk, v1.3.1, which has a Economy MPG sensor added for those stuck in the dark ages in the US and affiliated imperialists. There is also now an option under "options->other" to choose imperial sensors (miles, F, MPG, etc) or not (not checking the option means the normal metric ones). ECUTalk v1.3.1 can be downloaded from this page. v1.3 of ECUTalk has been completed, which has seen Feature Requests numbers 8-12 implemented, as well as a fair few other fixes. Fair amount of work has gone into it (taken over a month which is a bit more than usual). ECUTalk v1.3 can be downloaded from this page. See screenshots below to better understand difference between selecting sensors for gauges (batt, duty, econ, temp) which you check once, and for logging (rpm, injector, speed) which are checked a second time to make them grey. 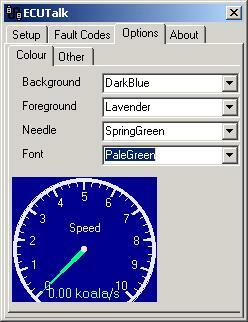 Also shown is how you can set the colour of the gauges yourself. Over the last week we've corrected an issue causing the main display not to work with 300ZX/Q45 users (and any other cars with V6/V8 engines with 1 AFM). This is fixed in v0.9 of firmware and beyond. The 2 users with 300ZX/Q45 cars as their primary car have been contacted for an update - everyone else can probably be updated whenever we get the trip meter functionality finalised. Thanks to Karl and Chan for helping to resolve this issue. Due to other commitments in the coming 6 months, we've decided to delay the redesign of next lot of Consult LCD Displays until after mid-year. Only one remains from the first batch, so we're pleased they've done so well. We'll be working on updates to ECUTalk Consult software from time to time until then. With any luck we may have time to add trip meter functionality for current users, but can't really guarantee anything at the moment. 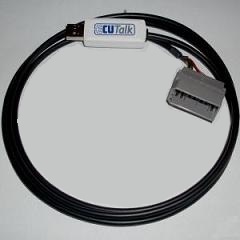 Current plans are for availability of ECUTalk Consult LCD Displays in January or February. The first batch (mainly limited to Australian users to help with testing) is almost complete, with 3 displays left. If you would like one of these remaining displays, send me an email (may not last long - overseas buyers are OK). I've discovered an issue with calculation of Injector Duty Cycle in ECUTalk v1.2 and the ECUTalk LCD Display (v0.7). The calculation was based on the assumption that the injector opening time was per engine revolution, but it is per power stroke of a cylinder (which in a 4 stroke engine, is every 2 revolutions). This will be fixed in the next release of ECUTalk software (v1.3) and ECUTalk Display (v0.8). I've completed v1.2 of ECUTalk, which has seen a few functional improvements as well as a significant change architecturally. From v1.2 and onwards, there will be no seperate Standard/Pocket PC versions - the same version can be run on both. 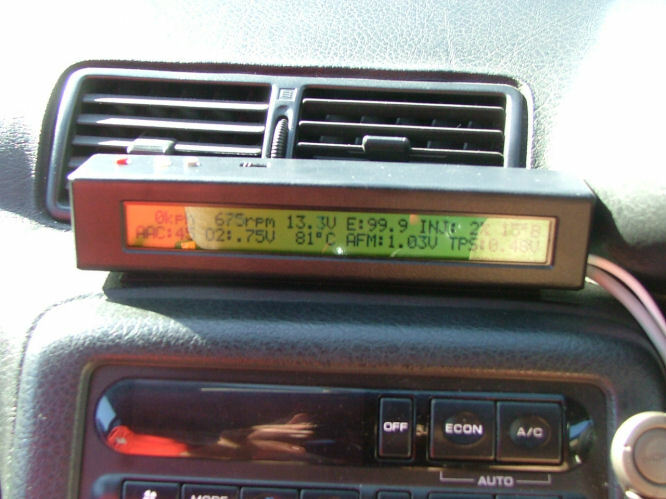 ECUTalk v1.2 is based upon the Pocket PC version, with changes to allow the gauges to be displayed full screen on whatever size screen you have (previous PPC versions would only show the 320x240 screen size when viewing gauges). It is also a single standalong .exe file, so run it from wherever you want (of course you still need the .NET Framework or .NET Compact Framework). I've updated the page for this release. The previous Standard and Pocket PC sections are now obsolete. ECUTalk v1.2 can be downloaded from this page. The Consult LCD is getting close to completion, so we've uploaded a video demonstration of the Consult LCD Display. We've also written up a commentary of the use of the device. We've also updated the Consult LCD Display with a couple of pictures of possible mounting positions. The device is slim enough to make a steering column mount perfect. We're compiling a list of setup's users have got the PPC version of ECUTalk working on. It should support any Pocket PC that can host the .NET Compact Framework and has support for a Serial COM port, but these are confirmed cases of it working (and the hardware used). See the Pocket PC Compatibility list.